Politburo Member, Secretary of the Ho Chi Minh City Party Committee Nguyen Thien Nhan received new ambassador of Uruguay to Vietnam Rosario Portell on December 12. 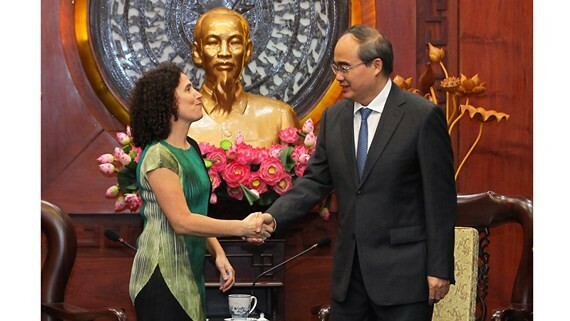 At the meeting, the secretary congratulated the Uruguayan ambassador in the new working term in Ho Chi Minh City, and highlighted the 25th anniversary of establishment of Vietnam- Uruguay diplomatic ties (1993- 2018). 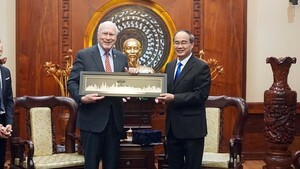 The city Party chief affirmed that Ho Chi Minh City expects to become a potential partner of Uruguay. He also desired that the new ambassador would play an important role in holding workshops, sharing information and experience with Vietnam’s small- medium scale businesses. Ms. Rosario Portell said that the bilateral relationship development between the two countries, introducing about nation, people and beautiful country of Uruguay to the Vietnamese people are considered as her major responsibility in the working term. With advantages of agriculture, livestock farm and software export, Uruguay is ready for sharing experiences and cooperating with Vietnam in general and with Ho Chi Minh City in particular, added Ms. Rosario Portell. On the same day, Chairman of the Ho Chi Minh City People’s Committee Nguyen Thanh Phong had a meeting with the new ambassador of Uruguay.